I don’t think it’s a secret that I LOVE all things fall! 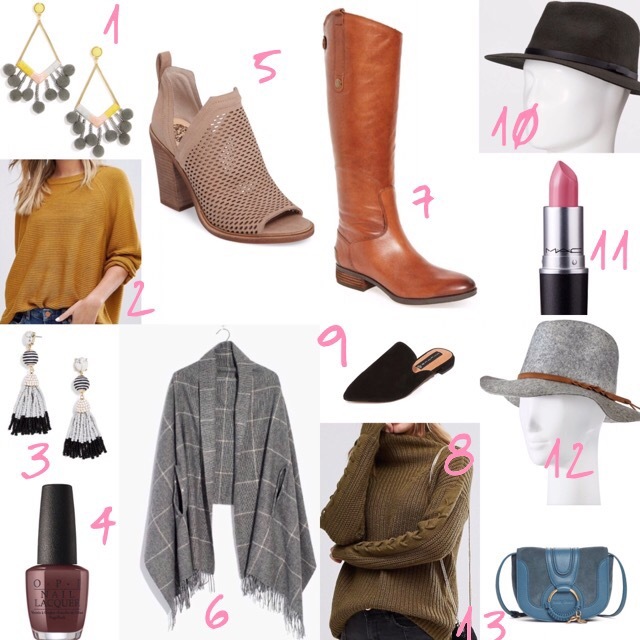 Give me anything pumpkin spiced, all the warmer colors, the best accessories (aka the hats I’ve linked above), layers, boots/booties (yes, even the much hated UGGs.. haha), hot soups and crock-pot recipes (if anyone has some they’d like to share, I’m all ears!! ), warm coffee in the morning, the changing color of leaves and of course Griffin’s first Halloween!! I haven’t written a post, I think in almost a month (oops, life is busy with a baby) but I am going to try so hard to get 2-3 posted per week… wish me luck (and by luck, I mean I need my handsome photographer to keep me on track— ohhhhh Daarik… if you’re new here, that’s my husband)!! So, I thought it would be fun to start back on the FIRST DAY OF FALL!!!! And with all of these fun goodies above because, let’s face it, every girl loves accessories, amiright?! I cannot wait to buy that gray wool hat, it’s on sale for under $10 at Target! Hope everyone has a great first day of fall and weekend!